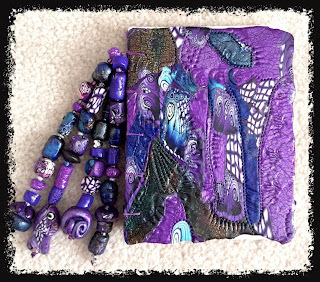 Awhile back I signed up for a Polymer Clay Journal Cover Swap over at the Polymer Clay Swaps group on Facebook. I was paired up with a lovely gal, Pat S., in Canada. This swap was originally to be one journal cover that the recipient could attach to a pre-existing journal. But since Pat was great at binding journals, she offered to make me a completed one. 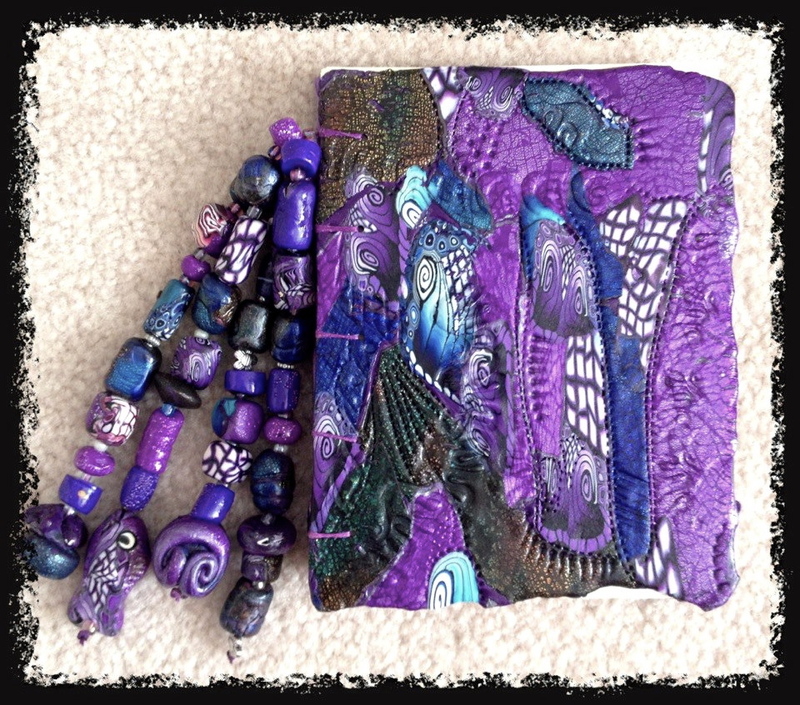 I let her know that since I had maybe bound one book waaaaay back when, I would at least make her two covers and include some beads. She likes to add tassels of beads hanging from the spine (very cool!). I love all the detail in her canework and texture! What a lovely combination of purples and blues. Thanks, Pat! As always, part of me always complains after I've signed up for a swap. Sometimes it can be where you have to make a whole set/theme of something depending on how many are in the group. Other times, like this one, you swap with just one person. But if you have ever debated about doing a swap, I would say this...do it because it's a great challenge for yourself. Look at it that way. Make your best work possible with the focus on the giving, not the receiving. Sometimes you may enjoy and love what you receive (as I have, with Pat), sometimes it might not be your taste, but participate with the intention of giving away the best you can do. I have come across new ideas and ways of working due to these different swaps, and I might not have come across or been pushed to that point of an idea had it not been for these challenges. And as a bonus, Pat and I have become good email friends, and I'm sure we will continue our correspondence in the years to come. Beautiful work from both of you. Jainnie, I love your colors and design!!! Love the work and swaps.